Really, how big is our world? This was a fun little story I made a little while back using Tableau. I love it because it's interactive. Go ahead and see for yourself! The presentation is clickable. I also made it available publicly on Tableau. I've updated it for April 2017 and decided to share. Hope you enjoy my little presentation! Tweet this: Looking at World Sizes this way really puts things into perspective. Sometimes, our default way of looking at our world can be our downfall because we are unable to see patterns, trends, and the emerging future. We get distracted by our inherent biases, politics, or country lines. It's not always easy to make yourself face the data, but what does the data tell us? 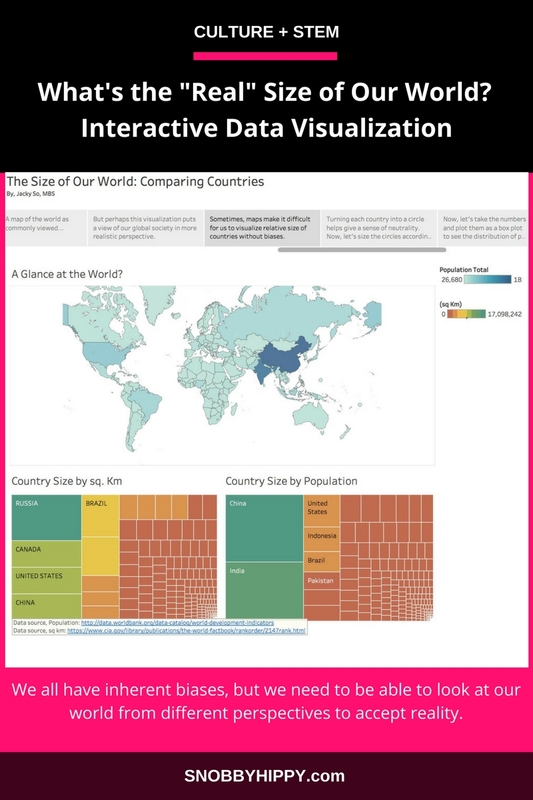 By visualizing facts and data, it helps us see our world in different perspectives, and it prepares us for global collaborations. Change is inevitable, but we have to be willing to accept that it's happening in order to continuously improve. Our world is changing, and if you're ready to adapt, you'll thrive and make many friends along the way!